Though known for their home made marshmallows, Wondermade has recently expanded into ice cream--homemade of course! We've had their ice cream a few times and I decided it's time to write about it, especially since I learned the other night that you can mix and match flavors in a cup! Wow! Eureka! The best of several worlds, nestled in one luscious cup. A recent evening "sanfording" (hanging out in downtown Sanford, one of America's best kept secrets, found us wanting a bit of dessert after a great dinner at another local place. Walking off our dinner in downtown Sanford, we found ourselves outside of Wondermade. Now, during the peak of summer heat, they are open late weekend evenings, and often packed. They were busy the night we visited as well. As we perused the selections and taste-tested a few offerings (the cornbread ice cream is very good! ), we learned that we could mix and match. 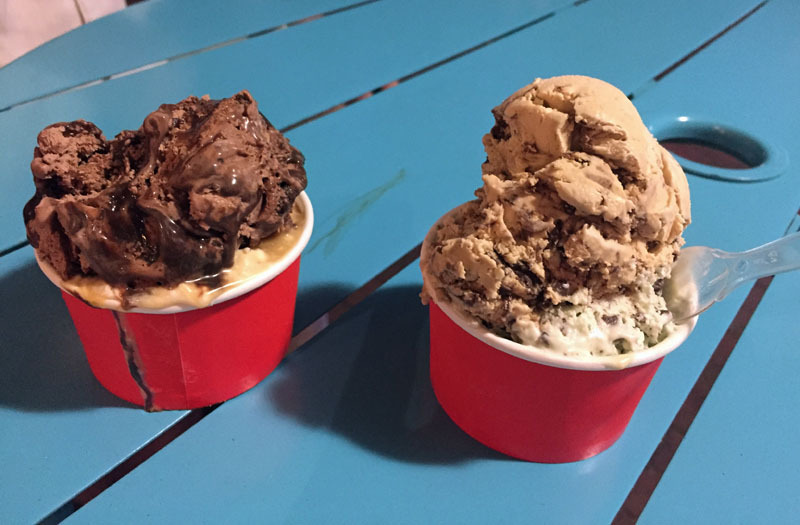 So I had the Mint Chocolate Chip topped by Mocha Chip (right) and Tommy had the Salted Caramel topped with Triple Chocolate (should be called Death by Chocolate, it is soooo chocolaty!). We sat outside, watching the world go by, enjoying the night air and enjoying this wonderful ice cream. This is so much better than anything else you can get, in part because it's homemade right there. They have really perfected the art of ice cream and take great care with the flavor. No washed out flavors here, they are all very intense and oh, so good. We ate every last drop and left satisfied. Wondermade started out making homemade marshmallows, and they still do a great business with them, many sold on the Internet. But if you're in the neighborhood, do stop by and try the ice cream. I guarantee, you will not be disappointed, and will not leave hungry. By the way, the cup pictured was filled way over the top and for only a mere $4 was a real bargain--it is that good!